An unusual joint cooperative management of a wildlife area by the NJ Audubon Society and the NJ Department of Environmental Protection. One encourages birding; the other permits hunting. 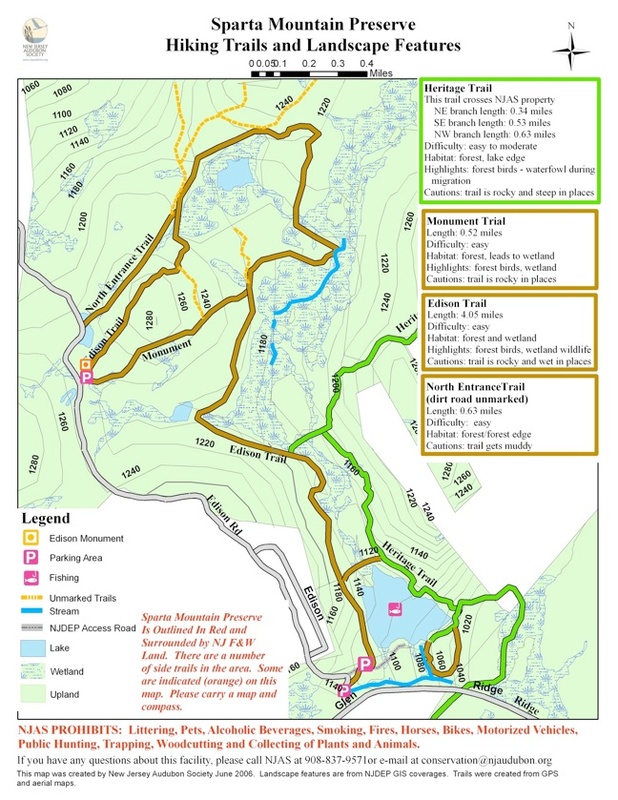 The Sparta Mountain Greenway, extending along the westernmost ridge of the New Jersey Highlands, includes a large tract of land purchased cooperatively by the New Jersey Audubon Society and the New Jersey Department of Environmental Protection, Division of Fish, Game, and Wildlife [NJ F&W], to establish the Sparta Mountain Wildlife Management Area. With divided stewardship come two areas with significantly different management plans. The Audubon Society section is closed to hunting at all times and offers hiking trails and woods roads to enjoy nature. The NJ F&W section is operated more like a traditional WMA, where hunting is allowed in season. Both have a variety of habitat types, including upland forest, lakes and wetlands. Click for a map showing the divisions between the two areas. Not surprisingly, given the Audubon's shared ownership, the entire area is prime birding territory. Thomas Edison invested in iron ore mining and limestone processing operations in the area - now long abandoned. Those activities left remnants of limestone strip mines, fenced-in mines opening, and landmarks associated with his name such as Edison Bog and Edison Pond, not to mention a nearby namesake town. See New Jersey Herald, “Edison's legacy still can be found in Sparta hills,” June 9, 2016 for a brief, interesting history of the man and the area.Adjacent parks include the Mahlon-Dickerson Reservation, Russia Brook Sanctuary. To contact the New Jersey Audubon Society use Contact Information on this web site. New Jersey Division of Fish, Game and Wildlife can be reached at 908-637-4125. The Edison Trail is just over 4 miles long and passes through a habitat of forest, lakeside and wetland. The trail may be rocky and wet in places. The Highlands Trail, a long distance trail, traverses roughly 1.5 miles of the management area, with one segment east of Ryker Lake. In addition to two named dirt roads - North Entrance Trail and Monument Trail - other linking trails, side trails and woods roads make loop hikes or in-and-out hikes possible. Use the Web Map link on this site to view an Audubon Society trail map and trail descriptions . Note: Trail names differ in some instances from other maps. In particular the Highlands Trail is identified as the HeritageTrail by the Audubon. Topographical PDF maps are available for download from the Table of Wildlife Management Areas. Several parking areas are shown, although local roads are not always clearly identified. 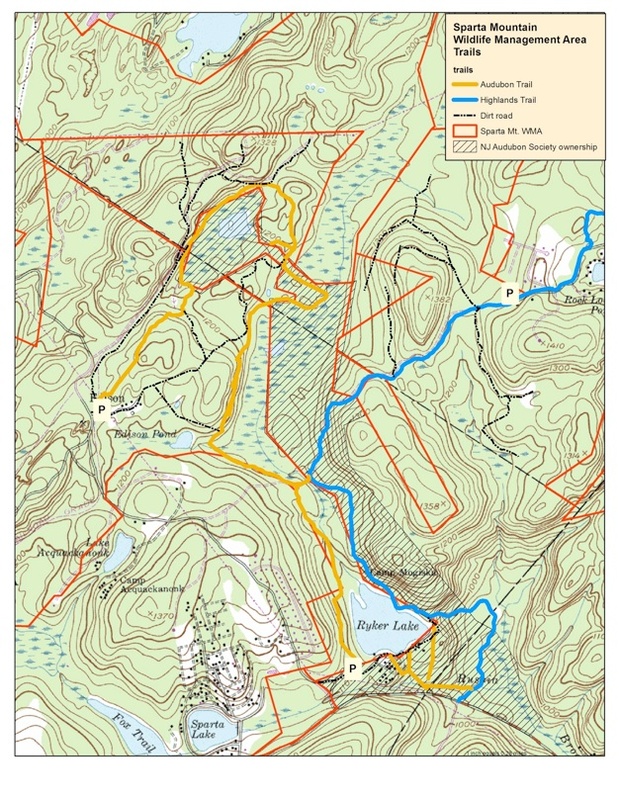 Parking areas for other sections of the park are identified on maps for Sparta Mountain management area in "Table of Wildlife Management Areas" -- use link elsewhere on this site.